The governor of Ebonyi state, Engr. 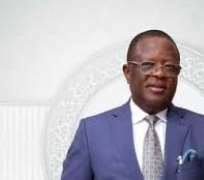 David Umahi, has raised alarm that the Indigenous People of Biafra (IPOB) threatened to kidnap five governors from Nigeria’s southeast region. He said that the fresh threat from IPOB was received via text message sent to his wife. “Just few days back, they sent text message to my wife that the 5 governors of south east would be kidnapped and that their security would over power that of the governors and after ransom are paid, they would kill them and kill themselves. “As a leader in the zone I must say that some of their complaints are genuine but the approach is very bad, that is why the leaders of south east is not in support of their approach. “And so, we are not against them but their approach. And as the Chief Security Officer of the state, I do not welcome them. Ebonyi state is not part of Biafra, we are a sovereign state. We don’t want to be colonised again; we are a state demanding better treatment in the affairs of our nation,” he said.